Hakonen system, Lonetrek region. On the 11th of March at 19:30 EVE Standard Time, Imperium forces fought with a loose coalition of alliances over a tower in the system. The tower in question had previously been reinforced by members of the Low Sec Voltron (LSV) coalition in a costly battle between the two sides, and the two were prepared for another round of fighting, this time to decide its fate. The Imperium managed to muster three entire fleets, including two Machariel battleship fleets and a Proteus strategic cruiser fleet with a large electronic warfare wing present as well. Estimates put the total pilots on the Imperium’s side at around 600. Against this the attackers assembled two Machariel fleets of their own, a full (256 pilots) LSV Machariel fleet, a joint 215 pilot Northern Coalition. [NC]\The-Culture [-T C-] Machariel fleet and an 88 pilot Pandemic Legion [-10.0] Maelstrom battleship fleet. Pandemic Horde [REKTD] was also present in the fight, having brought an estimated 70 pilot Ferox battlecruiser fleet. The allies flocked to the system, bridging in one by one or simply burning by gates. 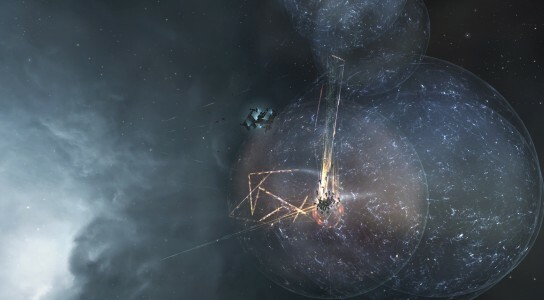 The LSV fleet had bridged in and quickly set up near the tower itself, waiting for the defenders while the joint fleet sat in a safe spot in the system, aligned to the tower and ready to warp in to LSV’s aid. The Pandemic Legion fleet remained docked in one of the system’s stations, waiting for the go signal as well. As the minutes wore on, tension gathered as the Imperium fleets slowly poured into the system, first one Machariel fleet, then the other. The Proteus fleet was still in transit when the two Imperium fleets perched on the tower grid before warping at long range of the LSV fleet and opening fire, starting the fight. While one Imperium Machariel fleet was content to shoot at long range, the other burnt straight towards the LSV fleet as allied reinforcements warped to the grid. The joint Machariel fleet landed at a ping below the two forces but at a decent range to snipe long range with its artillery cannons, hammering away at the Imperium fleets as the LSV fleet prepared for a close range brawl. Pandemic Legion had also warped to the grid, landing at long range of the two opposing sides and added its artillery cannons to the mix, targeting Imperium Machariels. Hammered by the three allied fleets, the Imperium fleets were quickly overwhelmed, their logistics wings attempting and failing to cope with the monstrous artillery barrages that were hurled at the mainline ships. Not despairing, the Imperium continued to fire back, managing to concentrate its formidable firepower on the hostile Machariels and at times volley them as well. The Imperium Proteus fleet had arrived by this point, warping to the battlefield and landing on top of the Maelstrom fleet, which had brought in four triage Chimera carriers as its logistics wing. The Proteus fleet attempted to open fire on the Maelstroms, which fired back and the two started to brawl at close range. Yet after it became quite clear that the strategic cruisers could not break the tank of the battleships, the Maelstroms chose to simply ignore the strategic cruisers and continue to concentrate their fire on the hostile Machariels, putting once again more pressure on them. The Proteus fleet continued to linger around the Maelstroms, which turned to be a mistake as the joint Machariel fleet quickly pinged on the grid before landing on top of it to help the Maelstroms. In rapid succession, Proteus and Legion strategic cruisers were simply shredded by the ensuing fire, forcing them to burn away. It is at this point that the Imperium shifted its main focus to the Pandemic Legion fleet. Several attempts were made to volley Maelstroms, but the triage carriers managed time after time to save the battleships, shield transfers catching the battleships as they hit deep armor. Realizing quickly that with the triage on field they would not be able to break the Pandemic Legion fleet, the Machariels concentrated their efforts on the carriers themselves, who managed to tank the incoming fire. All the while the allied Machariel fleets continued to hammer the Imperium forces, inflicting heavy casualties while suffering very few in return. The Imperium attempted to escalate matters, lighting a cynosural beacon on top of the Pandemic Legion fleet and bringing forth dreadnoughts. However, things did not go according to plan. Allies in the north such as Out of Sight. [OOS] had camped the nearest Imperium staging system, keeping the station bubbled and thus, most of the dreadnoughts stuck in the system. Only two managed to jump in and land, entering their siege cycles and targeting the carriers. Yet with the joint Machariel fleet there, energy neutralizers drained the capacitors of the dreadnoughts, silencing them before the rest of the allies simply chewed through and destroyed the pair. However, the dreadnoughts were able to push one of the triage carriers over the threshold and it went down, leaving three to carry on. Not deterred by their failure, Imperium forces attempted once more to drop dreadnoughts, managing to bring four more. With these dreadnoughts on field, the carriers once again came under heavy fire and caved in one by one, though the dreadnoughts themselves did not fare much better than their predecessors. By now the Imperium had been severely bloodied. The trade off between the two sides had grown more and more uneven, with the Imperium losing three, sometimes four mainline ships for each of the allied ones at the start. This ratio continued to worsen as the Imperium concentrated its efforts on the Maelstrom fleet, leading to up to ten mainline ship losses for each of the allied ones. Even with mounting losses and little to no success, the Imperium continued to focus on the Pandemic Legion fleet, one of the Machariel fleets quickly pinging on the grid and landing on top of it. Having lost most of its logistics support and knowing full well it couldn’t fight Machariels well at close range, the Maelstroms simply fired their micro jump drives, teleporting a 100 kilometers away and simply warping off the grid. This left the Imperium fleet to brawl the joint fleet, with both the second Imperium Machariel fleet and the LSV fleet joining in shortly. 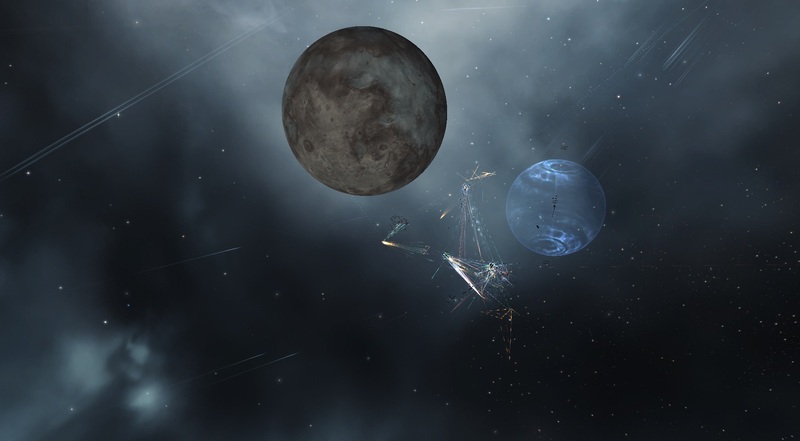 The Maelstrom fleet quickly rallied off grid and returned once more to the fight, the two sides now embroiled in a close range melee. Sniping again from a distance, the Maelstroms were able to volley the Imperium Machariels, who by now had been soundly thrashed by the allied Machariel fleets. 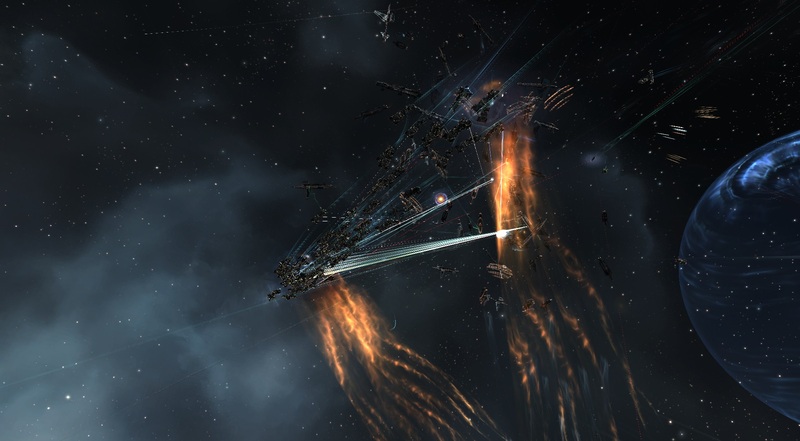 With one Machariel fleet obliterated and a second one bloodied and about to suffer the same fate, Imperium fleets simply retreated, fleeing back to their staging. 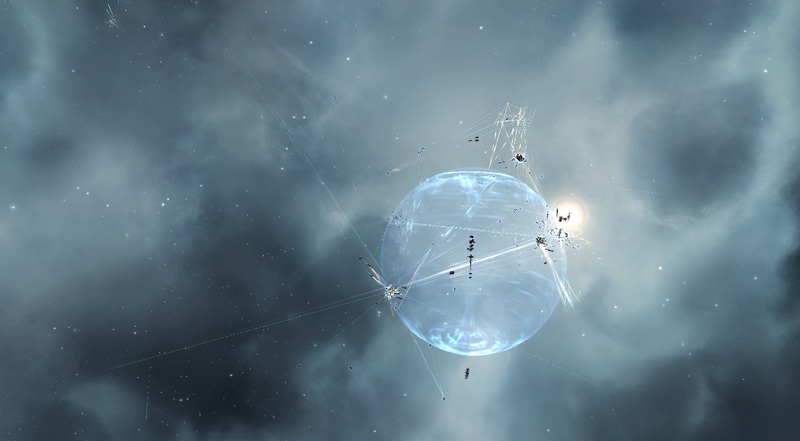 This left the allies to clear stragglers and take control of the grid. With the field secured, the allies simply destroyed the Imperium tower, managing to win both the field and the objective. Though the battle in Hakonen had been won, the fighting was far from over. The Imperium fleets were still extracting when Out of Sight. managed to snag the remnants of the Imperium Machariel fleet in the M-OEE8 system of Tribute, which also serves as Circle-Of-Two [CO2]’s staging system. The joint Machariel fleet quickly raced to the system to lend aid to the Out of Sight. fleet, which mainly kept the Imperium force tackled. Jumping in, the joint fleet opened fire on the Imperium ships, continuing the battle. The two sides quickly tangled near the Taisy gate in the system, exchanging close range volleys as the fleets maneuvered on grid. The first volleys saw ships on both sides cut down, but as time went on the joint fleet was able to command the field, decimating the Imperium Machariel fleet and managing to hold its ground. Yet, fighting in the enemy’s stronghold led to the Imperium managing to rally pilots and fleets to the aid of their tackled brethren. Reinforcements came in the form of the Proteus fleet which was en route home and had landed on top of the joint fleet’s logistics wing. Imperium triage carriers were also on the field, attempting to render aid though unable to save ships as the combined firepower from the joint Machariel fleet was enough to volley ships. Pandemic Legion, hearing about the battle unfold arrived as well, jumping in and anchoring up, with their artillery cannons helping make short work of the hostile battleships. However the logistics wing of the joint fleet was suffering, the pressure from the enemy strategic cruisers was multiplied by constant bombing runs by hostile bomber wings. The enemy stealth bombers continued to drop void bomb after void bomb on the logistic cruisers, effectively draining their capacitor and shutting them down. What’s worse, after the fight in Hakonen, the amount of cap booster charges left in the hold of the cruisers was severely diminished, leading to many of them running out during the fight. Unable to inject more energy, remote repairs simply turned off and logistics cruisers started exploding as enemy fire managed to cut them down. Seeing their logistics wing crumbling, the joint fleet quickly jumped in two triage carriers to the field. The carriers were not fitted merely to supplement the logistics wing, but to act as a damage sink as predictably, Imperium fleets concentrated fire on them. At the same time, both the joint fleet and the Pandemic Legion fleet burned back towards the Taisy gate as Imperium stealth bomber squadrons descended upon the field. Wave after wave of bombs hit the joint fleet’s Machariels, eroding their armor and inflicting casualties. By the time the fleet had made it to the gate and cleared its aggression timer, two major bombing runs had managed to destroy a large chunk of the fleet’s battleships. Reluctantly, the allies departed the system, allowing the Imperium to hold the field, though at a great cost. Battle report for the M-OEE8 system can be found here. All told the battle on its two parts lasted 2 hours and 10 minutes, with Time Dilation being ever present. 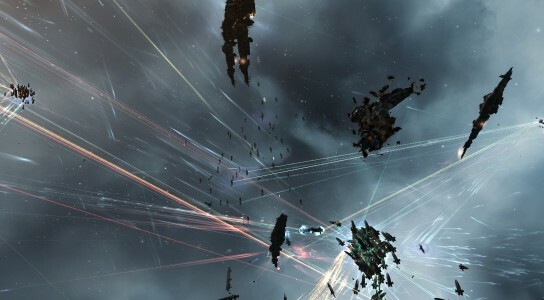 In the Hakonen portion of the battle, the system hosted 1230 pilots at the peak of the fighting with Time Dilation reaching 10% and remaining there for the duration of the fight. In the M-OEE8 system, the local pilot count reached 800 near the end, with Time Dilation steadily rising to nearly 30%. 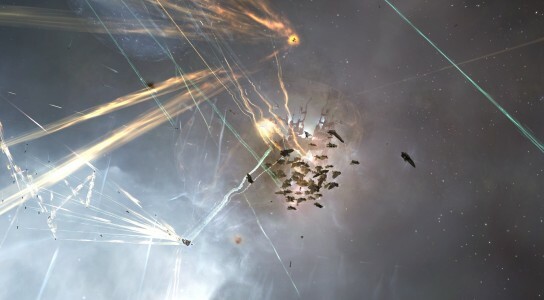 In Hakonen, Imperium forces lost 157 ships including 5 dreadnoughts, 99 battleships and 10 strategic cruisers while in M-OEE8, it lost 200 ships including 85 battleships and 9 strategic cruisers, putting the total damage at 147.75 billion ISK. In Hakonen, the allies lost 78 ships, including 2 carriers, 25 battleships and 10 battlecruisers while in M-OEE8, they lost 149 ships including 1 carrier and 80 battleships, putting the total damage at 100.91 billion ISK. Hi there. I found your blog by way of Google even as looking for a comparable subject, your website came up. It seems to be good. I have bookmarked it in my google bookmarks to visit then. Hiya, I’m really glad I have found this information. Today bloggers publish just about gossip and internet stuff and this is actually irritating. A good blog with interesting content, that’s what I need. Thanks for making this web site, and I will be visiting again. Do you do newsletters by email? Hiya, I’m really glad I’ve found this information. Today bloggers publish only about gossip and internet stuff and this is actually annoying. A good blog with interesting content, that is what I need. Thank you for making this web-site, and I’ll be visiting again. Do you do newsletters by email? Hello there. I found your website by means of Google at the same time as searching for a similar topic, your site got here up. It seems to be good. I have bookmarked it in my google bookmarks to visit then. Hello there. I found your web site via Google even as looking for a comparable subject, your website came up. It looks good. I’ve bookmarked it in my google bookmarks to come back then. Hey there. I discovered your web site by means of Google at the same time as looking for a related subject, your web site got here up. It appears to be great. I’ve bookmarked it in my google bookmarks to come back then. Hello there. I found your website by way of Google whilst looking for a similar matter, your web site got here up. It appears good. I have bookmarked it in my google bookmarks to visit then. Hey there. I discovered your blog by the use of Google whilst looking for a related matter, your web site came up. It appears to be great. I have bookmarked it in my google bookmarks to visit then. Hey there. I discovered your web site by means of Google even as looking for a related matter, your website got here up. It appears to be great. I’ve bookmarked it in my google bookmarks to visit then. Hiya, I am really glad I have found this information. Today bloggers publish just about gossip and internet stuff and this is actually annoying. A good website with exciting content, that’s what I need. Thanks for making this website, and I will be visiting again. Do you do newsletters by email? Hi there. I discovered your web site via Google even as looking for a related matter, your web site got here up. It seems to be good. I’ve bookmarked it in my google bookmarks to visit then.